To Metz, cinema is a type of identifier for the spectator, which in turn develops the viewer’s ego; since the viewer can identify a person in the film, although the viewer him/herself is not necessarily in the film, the basic fact that the viewer and character (and actor) are both persons allows the cinematic apparatus to work in developing a viewer’s ego. Metz makes a point that the viewer can identify with both the character in the film and with the actor of the film without necessarily seeing the actual reflection of the viewer’s own body in the film: “The spectator is absent from the screen: contrary to the child in the mirror, he cannot identify with himself as an object, but only with objects which are there without him” (48). Metz also refers to the camera and projector as literal/physical forms of the cinematic apparatus, but in all of his comparisons, there is a consistent duality at play: Metz discusses cinema’s effect of being both “projective” and “introjective,” and it being like a “phantom” or fictional tale yet with enough verisimilitude so that the viewer can gauge a sense of identity while viewing it (49-51). Ultimately, however, Metz doesn’t view the cinematic apparatus as any one thing with a single function; according to Metz, the cinematic apparatus is like an organic, living system or machine that has many parts and functions that work in numerous ways: “Chain of many mirrors, the cinema is at once a weak and a robust mechanism: like the human body, like a precision tool, like a social institution. And the fact is that it is really all of these at the same time” (51). So the cinematic apparatus, according to Metz, is not restricted to just the subject (viewer) and object (reflection), but rather it becomes a spectrum of perceptions through which the viewer can find numerous identifications through it, and this spectrum is in constant flux, but ultimately, a type of mirror, and therefore defined as kind of living illusion for the viewer. In “From the Kaleidoscope to the X-Ray: Urban Spectatorship, Poe, Benjamin and Traffic in Souls (1913),” Tom Gunning modifies the notion of the apparatus by emphasizing this very point that Metz makes, and he compares the cinematic apparatus to the kaleidoscope—a tool that moves patterns and colors for the viewer, thus shifting and changing the perspective with every movement through every moment. Gunning whittles down cinema to the world of the spectator, comparing it to something lavish, colorful, patterned and alive; aside from the kaleidoscope, he also compares it to a glitzy shopping mall, or a glittering city street; he repeatedly uses the phrase “visual delight” throughout his descriptions of cinema and what it is for the spectator (4-5). According to Gunning, because cinema never fails to be “moving,” “shifting,” “transforming” or “bustling,” it is a constant “visual delight” to the spectator (7). To Gunning, cinema is like moving particles in high heat in a dense space much like a city, and one that contains endless “fascination” through its movement for the viewer who is pleased by the sight. Like it is for Metz, to Gunning, the cinematic apparatus is like a living form, and one that engages the viewer. Thomas Elsassaer also brings up the notion of pleasure within the cinematic apparatus but from the perspective of the film’s characters, in particular the ones found in New German Cinema and most especially in Rainer Werner Fassbinder’s films. Elsassaer is more interested in the motives of the characters within Fassbinder’s films, and that is ultimately the pleasure of being seen. For instance, in gangster films such as Gods of the Plague and American Soldier, the characters are driven primarily by their wish to “play their roles ‘correctly’” (47). According to Elsaesser, the character’s role becomes an identity, and both the role and cinema create spectators; having spectators is the character’s ultimate wish: “…to be, in Fassbinder, is to be perceived…” (47). Having a spectator means that there is an audience, and characters take comfort in that because it confirms their existence. But the spectator must also be motivated to focus its viewership on the spectacle; and so, “…Fassbinder answers by showing the imaginary always constructing itself anew” (47). Much like Metz’ and Gunning’s comparisons, the cinematic apparatus is also alive for Elsassaer. Elsassaer examines the German psyche behind this type of exhibitionist motive, comparing Fassbinders’ characters to the mental state of working-class members who supported Hitler during his reign; whereas the bourgeois had a direct and visible connection to Hitler’s regime, the working-class’ support was not as visible; therefore, the working-class made conscious efforts to exhibit their support openly and in an obvious manner; being seen was a way of survival: “Fascism in its Imaginary encouraged a moral exhibitionism, as it encouraged denunciation and mutual surveillance” (49). If their support was not visible to the state, they might be misconstrued as being insubordinate or against the regime, which had dire consequences during Hitler’s reign. 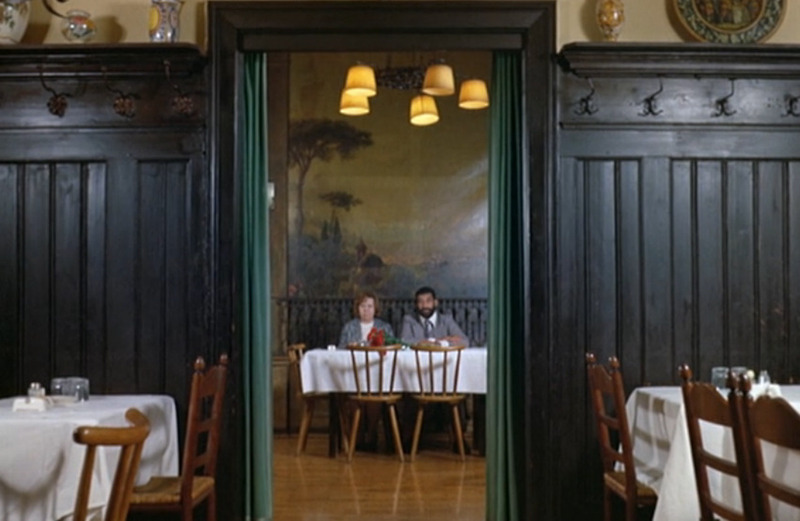 This feeling of a limited gaze not being enough to confirm a real existence is found in Fassbinder’s Ali: Fear Eats the Soul, where the two main characters—Emmi and Ali—are all both participants and themselves the objects of the gaze, and typically one of disapproval, e.g. when Emmi first enters the bar, she stares at the prostitutes and the foreign workers, who in turn stare back at her with curiosity and mild scorn for her age; once Emmi and Ali get together, the entire community containing Emmi’s coworkers, family, shopkeeper, and some members of Ali’s community—the prostitute/bartender and his coworkers—pass judgment on the union, calling it “unnatural” or doubting that it would last at all; when Ali and Emmi go to a public space such as a café or restaurant, the staff stare at them wordlessly and disdainfully. At the start of Emmi and Ali’s relationship—which blossoms before the gaze of many witnesses at a bar that Emmi wanders into out of curiosity and in order to get out of the rain—Emmi and Ali find that having only each other is enough; when Emmi goes to work and tells her coworkers a white lie that a foreign man offered to buy her coffee, her coworkers pass judgment on a fellow elderly woman who began seeing a Turkish man and became a town pariah for it; to this, Emmi responds that perhaps that woman doesn’t need anyone but her man. Eventually, though, both Emmi and Ali grow tired of each other’s limitations, and at some point, they even stop speaking to each other, but only gaze at each other; this does not lead to any resolutions in the strain in their relationship, but only drives them further apart. The only way that the couple is finally able to find reconciliation is later at the bar again, where Ali asks Emmi to dance with him as he’d done when they first met, he does so in the presence of many viewers. Having this community gaze is what gives Emmi and Ali pleasure in their relationship again, as it reaffirms that their relationship is in fact real. Whether the gaze from their community is one of disapproval or not is not the issue; what matters to them is whether they both exist as individuals and as a couple in the eyes of the community. But the question is, what happens after the music stops? Fassbinder answers this question by not letting the couple finish their dance: Ali collapses in pain and is taken to the hospital where he is diagnosed with a stomach ulcer, which has the potential to continue returning throughout Ali’s lifetime. According to Elsassaer, this ending is apt, as the couple now have each other functioning on a basic need and therefore not at all disgraceful as the community might regard; Ali is in need of a nurse and Emmi makes herself available as such, but through Ali’s illness, the couple also satisfies their need of a constant, and bona fide gaze, which is the doctor, who Elsassaer refers to as “an institutionally benevolent, sanitized father-figure” (48). No longer are they under the scrutiny of judgment, but the couple is legitimatized through Ali’s illness giving everyone involved a functioning and acceptable role; “role,” as mentioned earlier, is what gives characters a sense of identity, thus, both Ali and Emmi find a sense of identity in the end. Elsassaer concludes his point on the gaze that “for the German cinema to exist, it first had to be seen by non-Germans,” thus referring to German cinema’s need to be seen in order to be felt legitimized by spectators (52). To Elsaesser, the cinematic apparatus is a reaffirming gaze that brings comfort to the character knowing that he/she is in existence; the viewer is the legitimizing gaze—the bona fide one, much like that of the doctor in Ali: Fear Eats the Soul—and behaves as the object that provides meaning for not only the character in the film, but also the filmmaker and the film itself thus bringing comfort and pleasure.